What started as a fairly ordinary backshift, with a plan to join the Coastguard for a training exercise that evening, changed rapidly when my phone rang. "Steph - can you be downstairs in two minutes? "… Shortly after, standing outside the ED in scrubs in the snow with my boots under my arm, I joined the duty HEMS doctor en route to the Coastguard hangar. We met the Police arriving with a sealed blood box and set off in the Coastguard's enormous Super Puma helicopter, equipped and staffed for both primary and secondary retrievals. Plans had changed and rather than a training exercise the team had been asked to fly to an isolated island several hundred kilometres away to retrieve a patient with a bleed. The ferry and scheduled flights had been cancelled due to bad weather that day, and the fixed wing aircraft from Akureyri would not have been able to land. Before I could get to grips with what lived where in the aircraft, a further update was passed on from the first responder on the island requesting assistance with a second patient - unusual for a population of around 200 people to have two unwell at once! Our landing on sheet ice in swirling snow highlighted the difficulties in dealing with unexpected emergencies for such remote communities, but was handled without so much as a raised eyebrow by the pilots. Happily both patients were stable and comfortably transported to the nearest hospital. Even with two, there was plenty of room in the back for a navigator/winchman/EMT, mechanic/winch operator/EMT, prehospital physician, and me as an observer, without a squeeze - luxury! After a drop off and some teaching on the kit carried in the aircraft, the team were asked to assist in the rescue of a group of holidaymakers who had become stranded in their vehicles in snow in the mountains. In rapidly deteriorating winter conditions we circled for an hour looking for them, but were unfortunately unable to do so safely before the land based Search and Rescue team were able to help. Seeing the northern lights through night vision goggles on the way home was a totally new and unexpected experience though! 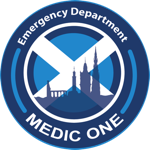 The week brought more experience on the shop floor, and plenty of inspiration from a team who have worked hard to establish Emergency Medicine as a new specialty. I stretched the limits of my own comfort zone helping to manage the airway of a critically ill obtunded patient with clinicians from four specialties all speaking (super-fast) Icelandic - manageable only thanks to some kind and prompt translations. The already high standard of training and education in the department continued with weekly M&M - this week presented jointly by a staff nurse and registrar. As previously there was lively but respectful discussion and plenty of engagement from all staff groups - great to see for me, and a particular reminder of how much our nursing colleagues are often willing to contribute to the debate when we schedule times we can all manage! The department's teaching this week was an introduction to the junior doctors on Prehospital Care and scene safety, and was a great overview for me on how services fit together. The following day brought more trauma moulaging and an opportunity for me both to help teach and be taught (I can put on a pelvic splint happily, but how many of us set up a rapid infuser often enough to do it confidently?!). Finally, one of the consultants with a special interest in health IT was kind enough to sit and let me ask every question under the sun on how the department has managed to make IT work for them rather than the other way around. With 20% of his contracted time devoted to IT, an in-house programming team, and an ED system built from scratch, there is a very close link between clinicians and programmers. The result is a lean, focussed IT system which can be rapidly changed to meet clinician demand - a current beta feature was suggested barely 8 weeks ago and is already being tested on the shop floor. Although I don't think that IT is necessarily the answer to everything - it can't magic up more beds or more staff - it was refreshing to see a pragmatic and responsive approach to help minimise time spent reading and writing documentation - something we can all make use of.